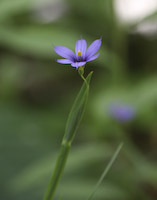 To the uninitiated, Blue-eyed Grasses look like flowering grasses. However, they are unrelated to the grasses. 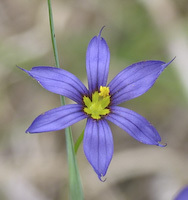 And although they are called "blue-eyed", the flowers are in fact "yellow-eyed" - examine the center of the flower shown below! 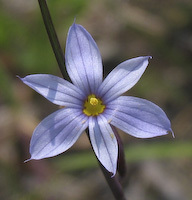 The various species of Blue-eyed Grass are difficult to tell apart. 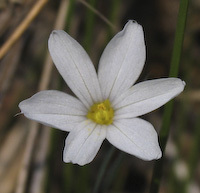 I have several species, listed below, which are differentiated mainly by the width of their stem and the colour of the flower.